Torah Vodaas Haggadah – In Stores NOW! You’ve worked hard. If you are a man, you’ve been reviewing the relevant Pesach halachos, striving to enhance your Pesach Seder, and have been looking forward to this year’s Seder for months. If you are a woman, you’ve scrubbed your house from top to bottom, covered every conceivable inch in the kitchen with silver foil and the like, and cooked up a storm of delicious-but-painstakingly-hard-to-prepare, kosher l’Pesach food. Now you want to enjoy yourself at the Seder. And that is exactly what you deserve to do. Buying a copy of The Torah Vodaas Haggadah is the perfect way to ensure a wonderful, inspirational, and uplifting Seder for you and your family. 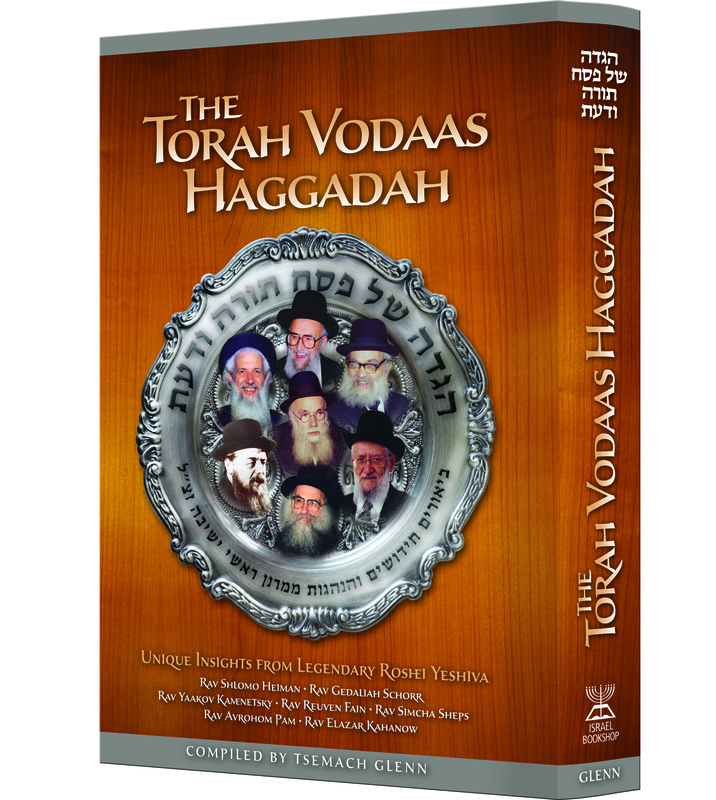 The Torah Vodaas Haggadah contains the original insights on the Pesach Haggadah of seven of the legendary Torah Vodaas roshei yeshivah: Rav Shlomo Heiman, Rav Gedaliah Schorr, Rav Yaakov Kamenetsky, Rav Reuven Fain, Rav Simcha Sheps, Rav Avrohom Pam, and Rav Elazar Kahanow, zichronam l’vrachah. Additionally, it provides beautifully-written biographical sketches of each gadol, as well as their unique Pesach minhagim. This Haggadah is truly one of a kind. The divrei Torah it includes will fill you with emunah, while inspiring you with the depth contained in each one. For years, these great roshei yeshivah led their talmidim and Klal Yisrael. Now you can allow them to lead your Seder with this handsome Haggadah. The Torah Vodaas Haggadah. It’s an investment in your family’s Seder; an investment in your Pesach experience. The Torah Vodaas Haggadah, one of the most anticipated haggados to be published in years, is taking its place of prominence at the forefront of the retail displays. The product of months of preparation, this unique sefer is a compilation of the divrei Torah of seven prominent Roshei Yeshiva who—collectively—led Yeshiva Torah Vodaas for nearly a century. A perfect complement to the Seder, this work includes, in addition to the Roshei Yeshiva’s divrei Torah, the Pesach minhagim of these legendary figures, as well as biographical sketches of their lives. Beautifully laid out in a most aesthetically pleasing way, the Haggadah is a delight for the eyes as it is for the mind and heart. This project was the brainchild of Tsemach Glenn, a devoted talmid of Yeshiva Torah Vodaas. While still in the yeshiva, he developed a close relationship with Rav Simcha Sheps, Rav Avrohom Pam, and Rav Elazar Kahanow zichronam livrachah, and he initially planned to compile the Pesach divrei Torah of just these three Roshei Yeshiva. Upon the advice of Rabbi Binyomin Zev Karman, a colleague from his days as a talmid in Torah Vodaas, Glenn decided to also include in the Haggadah the works of Rav Reuvain Fain and Rav Gedaliah Schorr zichronam livrachah, under whom he had learned. As the project progressed even more, Rav Yaakov Kaminetsky zt”l was added, due to Glenn’s close relationship with his son, Rav Binyomin Kamenetsky shlit”a. Finally, it was decided to include Rav Shlomo Heiman zt”l as well, since he passed away childless and many of his talmidim at Torah Vodaas, who felt like they were his children, wanted to do something in his memory. Given the sheer magnitude of divrei Torah available from these Roshei Yeshiva alone, it was necessary to peruse many, many of their works and the writings of their talmidim in order to narrow down and select the pieces that would be most appropriate for this Haggadah. From the onset, the writers hired for this project strove to have the sefer bring out the greatness of the miracle of Yetzias Mitzrayim, impart emunah, and foster a feeling of ahavas haTorah. Indeed, their goal was met with success, and the Torah Vodaas Haggadah truly does all of the above. The beauty of this Haggadah is that it really encompasses the length and breadth of Torah Vodaas history. Rav Shraga Feivel Mendlowitz zt”l sought to infuse his talmidim with a broad array of Torah views and personalities. The authors managed to capture the essence of each one of these Roshei Yeshiva: the measured logic of Rav Shlomo Heiman; the Chassidic insights of Rav Gedaliah Schorr; the truthful and novel elucidation of Rav Yaakov Kaminetsky; the mussar of Shanghai and the “Mir element” of Rav Reuvain Fain; the fiery passion of Rav Simcha Sheps; the eloquence and eidelkeit of Rav Avrohom Pam; and the halachic brilliance of Rav Elazar Kahanow, zichronam livrachah. There is no doubt that this Haggadah has something for every reader, no matter who he or she may be. From Kaddesh through Nirtzah, readers of The Torah Vodaas Haggadah will be able to envisage these masters of Torah and mussar imparting to them the emunah and ahavas haTorah that they possessed. Indeed, a Torah Vodaas talmid learning from this Haggadah will transport himself back to the shiurim of his great rabbeim. For others, they will be drawn to these gedolim of yesteryear, and will feel an immediate connection with them. Either way, The Torah Vodaas Haggadah will surely give you a Pesach experience to be long remembered. This entry was posted on Tuesday, March 29th, 2011 at 11:46 am and is filed under General, New Books. You can follow any responses to this entry through the RSS 2.0 feed. You can leave a response, or trackback from your own site. One Response to Torah Vodaas Haggadah – In Stores NOW! This Hagadah is an absolute masterpiece! Stunning biographies about each gadol, amazing insights on the Hagadah and little known minhagim of the illustrious Roshei Yeshiva of Torah Vadaas. A must read, and learn for all of the thousands alumni of Torah Vadaas, and a real inspiration for anyone.